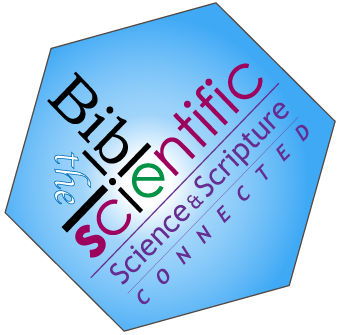 "The Bible Scientific" is my current blog series. Each post will examine a verse or two directly from Scripture and try to explain that Biblical quote from a scientific perspective. It is often stated that the Bible and Science are not compatible, that the Bible is not a scientific text and that you can not believe the Bible and also believe science. I think this is short sighted as there are a number of places in Scripture where scientific facts were stated even before man understood them. The Bible is not a scientific text in that it is not meant to be the full explanation of scientific fact, but it does direct us to understand the nature of God scientifically as well as spiritually. It complements science. God uses His Word to help us understand Him and His creation with our mind, soul and spirit. "The prohibition of science would be contrary to the Bible, which in hundreds of places teaches us how the greatness and the glory of God shine forth marvelously in all His works, and is to be read above all in the open book of the heavens." Psalm 104 is an elaboration of the physical creation events. Each section of verses detail another small part of creation - the Earth covered with water, the separation and formation of the land, the water cycle, plants and animals, food for all creatures, man works in the day and the animals hunt by night, the vastness of the oceans teeming with life and God's Sovereignty over ALL of His creation! Specifically, Psalm 104:2 can be divided into two parts - "The LORD wraps himself in light as with a garment" - pointing to His invisible nature, and "He stretches out the heavens like a tent" explaining how He formed the universe. Taking part one we find that God, by nature, is invisible and He is so majestic that He can use the light of the universe as His garment. This part of the verse also points to how we can see God in His creation when we look to the heavens (see Psalm 19:1 and Romans 1:20). The second part points to the heavens as being "stretched out" (expanded) like a tent. As we see in the Big Bang Theory, the universe expanded from a singularity and science currently afirms that the universe is still expanding. The Hebrew word used here for tent is "yĕriy`ah." It means a tent, curtain, drape, or veil - a fabric that can be hung up as in the tent of the tabernacle in the desert during the 40 years of wandering. This could be God's dwelling place (the heavens) or it could be indicating the shape of the universe as flat like a curtain but being a place where creation can exist. 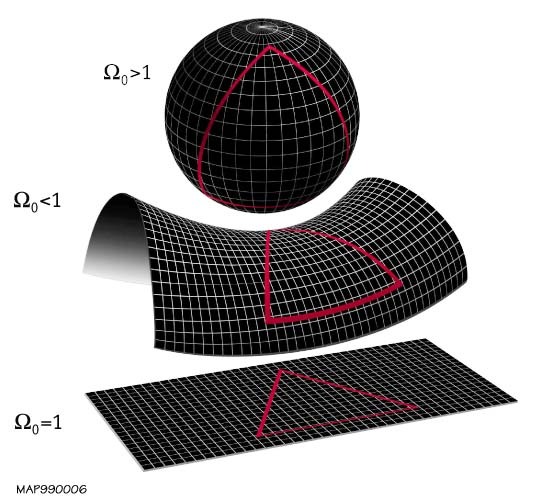 Einstein's theory of General Relativity says if the critical density is equal to the actual density of the universe, it is flat, as opposed to curved like a sphere (more dense - closed) or a saddle (less dense - open). Scientists think that the actual density of the universe is equal to the critical density, and thus think the universe will extend forever like a flat piece of paper. Currently the universe is still stretching out but the expansion rate will slow down gradually, over an infinite amount of time. Thus, the universe is considered flat and infinite in size. NASA's Wilkinson Microwave Anisotropy Probe (WMAP) measured background fluctuations in an effort to determine whether the universe is open or closed. In 2013, scientists announced that the universe was known to be flat with only a 0.4 percent margin of error. Therefore this verse (Psalm 104:2) matches with what science has found based on the Theory of Relativity, that the universe is stretching out (expanding) and is like a tent or curtain (flat). The speed of light limits us to viewing the volume of the universe visible since the Big Bang; because the universe is approximately 13.8 billion years old, scientists can only see 13.8 billion light-years from Earth. The universe will continue to grow until it all burns out (entropy - second law of thermodynamics). We will look at this idea next time in Hebrews. Hebrews 1:10-12 (NIV) - He also says, “In the beginning, Lord, you laid the foundations of the earth, and the heavens are the work of your hands. 11They will perish, but you remain; they will all wear out like a garment. 12You will roll them up like a robe; like a garment they will be changed. But you remain the same, and your years will never end. Job 25:2 (NIV) - Dominion and awe belong to God; he establishes order in the heights of heaven. This verse shows that God has created an all-encompassing order to the universe. Science has found that all physical laws apply to the whole universe everywhere and equally. This concept is called "The Cosmological Principle." "The cosmological principle is usually stated formally as 'Viewed on a sufficiently large scale, the properties of the universe are the same for all observers.' This amounts to the strongly philosophical statement that the part of the universe which we can see is a fair sample, and that the same physical laws apply throughout. In essence, this in a sense says that the universe is knowable and is playing fair with scientists." The cosmological principle is first clearly asserted in the Philosophiæ Naturalis Principia Mathematica (1687) of Isaac Newton. Newton conceptualized the Earth as a sphere in orbital motion around the Sun within an empty space that extended uniformly in all directions to immeasurably large distances. Earlier cosmologies held that the Earth rested at the center of universe, with the sun and moon rotating around it. Newton also asserted the uniform extension of the physical laws of motion to a great distance beyond the observational location of Earth itself. Now if we translate this verse from a more scientific bent, it might say this - "The great power and rule of God brings order to all the heavens. "The great power and rule" are the physical laws that we see everywhere in the universe. Thus God, by His all-powerful nature, created the heavens and holds them in place by the physical laws He established. For man to be able to examine and understand anything about the universe around us, the laws of physics must apply uniformly and completely to the entire universe. This is my third entry in a new series of posts called "The Bible Scientific." Each post will examine a verse or two directly from Scripture and try to explain that Biblical quote from a scientific perspective. If you have a favorite scientific verse or have a verse you would like reviewed, just send a note in the comment section at the bottom of this blog post. I will try to include it in a future blog entry. Genesis 1:2 (NIV) – Now the earth was formless and empty, darkness was over the surface of the deep, and the Spirit of God was hovering over the waters. Science is just now wrestling with the concept of the earth as the only source of life. Science is starting to find exoplanets, planets outside our solar system, and claiming that they may be suitable for life (any life, not just intelligent life). But on the other hand, science is also finding specific conditions that must exist on such a planet, hundreds of them in fact, such that the earth is the only planet so far that seems to meet them all. It is estimated that there is about 1024 planets in the visible universe. Even then it is a wonder the earth does meet them as the odds are strongly against it, even to the limits of an impossibility (only one planet in over 30 trillion universes in a multiverse existence might meet all of the hundreds of known specific conditions that a planet must have to sustain intelligent life). Reasons to Believe (Reasons.org) has lists of these specific conditions that must be met for life to exist. One such list claims 501 specific conditions just for bacterial life to survive for 90 days. The odds of even one planet meeting all 501 conditions is less than 1 in 10311. The Hebrew words used in Genesis 1:2 point to a formless earth (the primordial soup? ), and God hovering over it. The Hebrew word for "hover" is "rachaph" which implies a watchful, loving attention to the entire creation process, much like a mother eagle hovering over her chicks. God watched over His creation, and still does, to bring it to its full glory (reducing those 1 in 10311 chances down to 1 in 1). Genesis 1:2 also portrays a world covered by water, before the formation of the continents, with a thick blanket of clouds (water or other vapors?) surrounding it such that much of the light from the sun was blocked out (could not see the sun as a sphere from the surface of the earth). The temperature of the surface was no doubt warmer too - possibly a perfect incubator for the creation of the beginnings of life - microbes. Next up: Job 25:2 (NIV) - “Dominion and awe belong to God; he establishes order in the heights of heaven. This is my second entry in a new series of posts called "The Bible Scientific." Each post will examine a verse or two directly from Scripture and try to explain that Biblical quote from a scientific perspective. If you have a favorite scientific verse or have a verse you would like reviewed, just send a comment in the section at the bottom of this blog post. I will try to include it in a future blog entry. Genesis 1:1 (NIV) - In the beginning God created the heavens and the earth. The Hebrew word used for "heavens" here is "shamayim" which means "a high and lofty place," that is, the abode of the stars - the universe. Then the writer uses the word "'erets" which means land or earth - as opposed to the heavens. But isn't the earth part of the heavens? The point I am making here is one of perspective. I consider the Bible as the inspired Word of God. But, it is written by man and thus the perspective of the writer is one of being on the earth, and what that looks like in the context of the Scripture. In Genesis and the Creation story, the Bible is written from the writer's view on earth looking up into the heavens - what would he see? In Genesis 1:1 the writer would see (if he was there!) the creation of the heavens - the explosion that was the "Big Bang" and the coming together of the stars and sun and planets. But the writer did not see this, as man was not created until the sixth day! One of my readers pointed this out to me indirectly. He stated the the Sun and Moon were not created until the fourth day, after the plants. How could this be as plants, created in day 3, need light to grow. A more careful read actually shows that light was created on the first day, and the separation of the light and the dark became the night and the day - essentially the sun and the moon (Genesis 1:3-5). But the sun and moon were not visible from earth on the first day as earth's atmosphere was not as it is today - transparent - it had too much methane, which produced a thick hydrocarbon fog and only light could pass through. From the surface of the earth, neither sun nor moon was visible. On the fourth day (Genesis 1:14-19), God cleared the atmosphere so that the sun and moon and stars became visible from the earth. At this point the movement of the sun, moon and stars relative to the earth also became visible. The word "ma'owr" is used here for the word light, not the same word (but from the same root) as used for light as in Genesis 1:3. "Ma'owr" means a luminous body - the now visible sun and moon. Making them visible was necessary for animals, created on the fifth day, that used them to be guided by the seasons to hunt and migrate. Plus, as Genesis 1:14 says - “Let there be lights in the vault of the sky to separate the day from the night, and let them serve as signs to mark sacred times, and days and years...", a visible sun and moon ultimately allows for man to mark his lifetime. Also the verb used in Genesis 1:16 ("God made two great lights—the greater light to govern the day and the lesser light to govern the night.") for "made" is "`asah" which does not mean to create from nothing, as "bara'" does, but implies taking something that already exists and accomplishing an action with it - as in making the sun and moon visible from the earth. Remember, in my view, that the days here are not 24 hour days but individual stretches of time (the word used in Genesis 1:5 for "day" is "yowm", which can mean an amount of time from a 24 hour day into long periods (millions?) of years for each "day") during which God guided His creation to become that which He wanted, one that can support all the living things He desired to create, including humans - created after His image. Next time we will look at: Genesis 1:2 – Now the earth was formless and empty, darkness was over the surface of the deep, and the Spirit of God was hovering over the waters. I am starting a new series of posts that I hope to be shorter, more focused and posted more frequently than I have in the past. Each one will take a verse or two directly from Scripture and try to explain that Biblical quote from a scientific perspective. I am calling these blog posts "The Bible Scientific" with a notation to the specific verse(s) that I am discussing. We will start our new series below in Genesis. If you have a favorite scientific verse or have a verse you would like reviewed, just send a comment in the section at the bottom of this blog post. I will try to include it in a future blog entry. The Hebrew word used for "create" here is "bara'" which means "to create absolutely," that is, to create from nothing. Scientifically, this verse declares something akin to the Big Bang, that in the beginning the universe was created from nothing. Up until about 90 years ago, science stated that the universe was eternal, had always existed (and thus had no cause). It wasn’t until the 1930’s that the concept of the explosion of a singularity blooming into the universe was first conceived, and with it the beginning of time, space and the physical laws of nature. It took until the late 1950’s for scientists even to agree on such a theory. Moses, identified in the Bible as the author of Genesis, is estimated to have lived about 1500 BC. Secular sources identify Genesis as being written between the 10th and 5th century BC. In either case, if Genesis 1:1 labels the creation of the universe as something synonymous to a "Big Bang," it was certainly much earlier than it was defined by science. And it appears that the Big Bang had to be fine tuned to such a degree that even the smallest of change would have resulted in no universe at all. "If the rate of expansion one second after the Big Bang had been smaller by even one part in a hundred thousand million million, it would have recollapsed before it reached its present size. On the other hand, if it had been greater by a part in a million, the universe would have expanded too rapidly for stars and planets to form." "[Big Bang theory] suggested that matter and motion originated rather as Genesis [in the Bible] suggests, ex nihilo, out of nothing, in a stupendous explosion of light and energy." "Many scientists did not like the idea that the universe had a beginning, a moment of creation." Now some scientists are questioning the Big Bang again, it seems, because it speaks of something beyond the beginning of time. This is the "Cosmological Argument" - that everything that had a beginning had a cause - a transcendent cause outside of itself. Genesis 1:1 shows that there was existence before the creation - God (who by definition had no beginning) had to exist outside of, and before, the dimensions of time and physical space came to be - the universe has a transcendent cause, AND a Creator. Science does not like that (it can not be proven or tested scientifically). New theories are looking for a universe created by the Big Bang but without the need for God to be the transcendent cause. "The big bang theory does not describe the birth of the universe … Another theory describing even earlier times will be needed to explain the original creation of the universe." So is another theory needed? Can science develop a theory that will truly answer the question "What caused the Universe?" If the creation of the universe was the start of space and time, everything "physical" and the natural laws that govern it all, is it possible to find something else that could have created the universe from outside of those restraints when science cannot even see beyond them? Science in the past explained that the universe, "just existed," and needed no explanation for its existence when it was thought that the universe was eternal. Why is it not possible to say the same for a God who created the universe. Could not an eternal God be that cause, even though we can not prove that or even prove that God exists, scientifically? Psalm 102:25 – In the beginning you laid the foundations of the earth, and the heavens are the work of your hands. Next up: Genesis 1:2 – Now the earth was formless and empty, darkness was over the surface of the deep, and the Spirit of God was hovering over the waters.